The vintage Mattel Allan doll is 12" tall, he was first introduced in 1964 as Ken dolls friend, he has the same body size and markings as the Ken doll and shares his extensive wardrobe. Allan has just two outfits made and tagged "Allan"; his original swimsuit with striped jacket and the Best Man outfit shown below. Allan is Midge Hadley's boyfriend, sometime in 1966 the Allan doll was discontinued from the Mattel line, then reappears again after 1990. Straight legs, molded red hair, brown eyes, solid blue shorts, horizontal striped jacket or vertical striped which is less common with white terry cloth collar that is bonded to the fabric, blue strap cork sandals and a black wire stand. The same as the straight leg doll, but with bendable legs, new red jacket, lighter blue shorts, blue strap cork sandals and a black or gold wire stand. Markings are the same as the straight leg Allan doll. 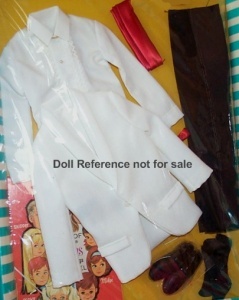 This was the only outfit specifically made for the Allan doll other than his original swimsuit attire; it featured a white dinner jacket with half white lining, black zippered pants with soutache braid down the outside legs, white lace and pearl button trimmed white long sleeve shirt, red satin cummerbund and bowtie, black knit socks and black shoes. This is the only case known that features only the Allan doll, he is shown wearing the Saturday Nite Date outfit. This case is made of a heavy navy blue vinyl and was featured in a Barbie Bazaar, Feb 2000 article. It was probably made for the Canadian market. The Allan doll was named after Barbara Handler's (Mattel founders daughter) real husband Allan Segal. Only one Mattel vinyl case shows a graphic of both Barbie and Allan together, a high valued case. The Segal's have two children; Cheryl and Todd. The Segal's divorced in the 1960s, the Allan doll disappeared from the doll line in 1966, reappearing again after 1990.